Every year I create an original, stippled, ink drawing while my students work on their ink assignments. I attempt to commemorate an important event or experience with these year end drawings. This year's drawing is finally completed and I will now reproduce it on personalized, adhesive labels for use as bookplate gifts for friends, family and coworkers. This year has been wonderful in many ways. I have had lots of fabulous adventures but one of the major events of the year was the wedding of our youngest daughter. We used lots of sentimental touches at her wedding which was held at a former post office. One of the special decorations was built using letters my parents had written back and forth to each other in the 1930's. 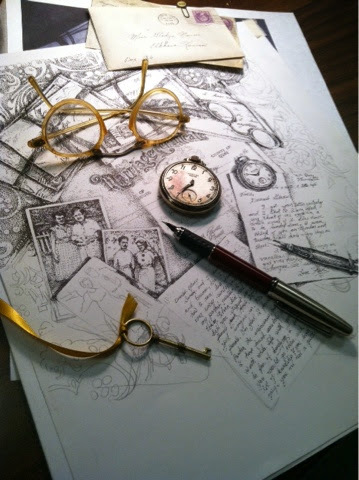 I reproduced the treasured envelopes my mother had kept, tied them up with ribbons and displayed them under glass cloches. I knew I wanted to use these letters in my 2014 bookplate. 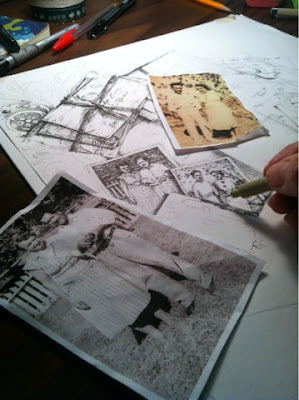 A few weeks ago I gathered some vintage keepsakes, pictures of my mother and father and laid them out with the letters. I was shocked to discover that I even had my parent's wedding license in a box I'd kept after my mother passed away. I also had a pair of my mother's old eyeglasses. It was very emotional to build this drawing. It is created with millions of tiny dots so it took an enormous amount of time to complete. 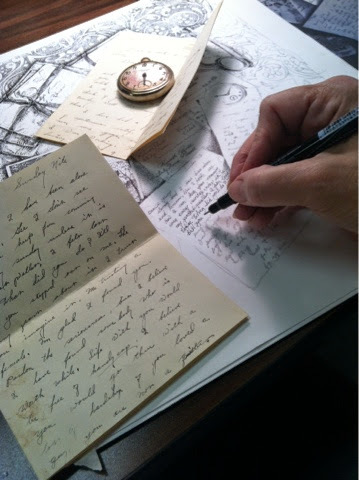 I was surprised to find myself feeling so close to my father as I rewrote his letters trying to replicate his handwriting. My father passed away when I was 19 so it was bittersweet to follow each stroke he made on the page. My parents eloped to nearby Tucumcari, NM to marry. It was right at the beginning of the depression and the dust bowl which ravaged our Oklahoma prairies. My parents returned to live separately with their parents until they could make their home on the family farm. They were brave, courageous people who didn't just save the farm but lived out their lives working that land. My siblings and I still own the farm together as tribute to their hard work during difficult times. I only edited a few things from my Father's letters - not because they were in any way juicy but I wanted to include special passages and sentiment. I tried to replicate my Father's handwriting the best I could with the limitations of making only stippled/dot marks. 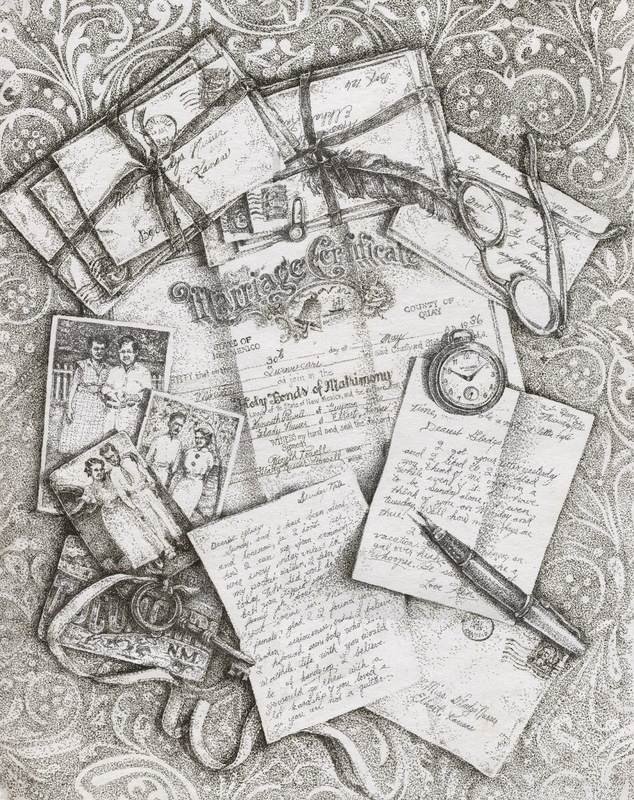 I included a few keepsake items in the drawing. These are my mother's old eyeglasses plus the fountain pen we used for my daughter's wedding guest book and one of the vintage keys we also used at my daughter's wedding. The old pocket watch has it's time set to 10:10 which is my husband's birthday. With a drawing dedicated to love I just had to have him in there somewhere. After working on the piece for a few days I also decided to include a vintage wallpaper looking background. With the challenge of creating so many white paper subjects (which was a challenge by the way) I thought the piece needed a little more jazz. With the completion of this piece I am closing up my studio for the holidays. Thank you to everyone who is following me, admiring my work and visiting my online shop. It has been a wonderful year and I am grateful for the success of my studio, the blessing of being a working artist and for my wonderful family. Have a terrific holiday season, my friends. Your talent is just amazing! This piece is so meaningful and just a delight to gaze into. Beautiful, sentimental treasure. Wow! This is gorgeous! I love the detail and how wonderful for your students to see you at work.